The optical density of Solar Viewer AstroSolar® Silver/Gold is OD 5.0. Our Solar Viewer are CE-certified and comply to the Norm EN ISO 12312-2:2015 – thus they are certified for a safe and direct view into the sun. AstroSolar® Silver/Gold has no added treatments to attain fine-optical properties necessary for high magnification work. It is not suited to being used in combination with telescope, binoculars, spotting scopes or camera lenses. We are producing Baader AstroSolar® Silver Film for more than 25 years. In the year 1999, during the grand total eclipse over Europe, more than 20 million solar viewers equipped with this film were in use. For the great american solar eclipse in USA 2017 we now introduce the successor to the market: Solar Viewer AstroSolar® Silver/Gold, with eye-sided reflex-free material for an excellent viewing experience. When using precision-grade AstroSolar® Safety Film for telescopes, perfect optical quality is most important. However – this film must be treated with great care since the metal and protective coatings applied onto both sides of the film are very similar in their technical properties to the reflective surface applied onto astronomical mirrors. making it scratch resistant without sacrificing in sharpness and without creating a double image of the Sun due to adding up several layers of dark and/or reflective film onto each other. 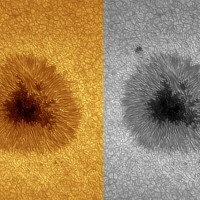 A single layer of AstroSolar® Silver/Gold Film provides a perfectly sharp and energy balanced solar image – including the ability of identifying large sunspots and without transmitting irresponsible amounts of infrared(heat) radiation as with simpler sooth-filled energy absorbent films which do not offer added IR-blocking by metal reflective coatings. Due to the dual side metallization process designed for AstroSolar® Silver/Gold Film, the film remains safe for a straight look into the Sun, even in case the front side of the viewer would suffer a scratch or mild kind of abuse. Still every solar viewer must always get a thorough inspection by the user to detect possible damages due to wrong handling and must be discharded in case a defect would be visible. 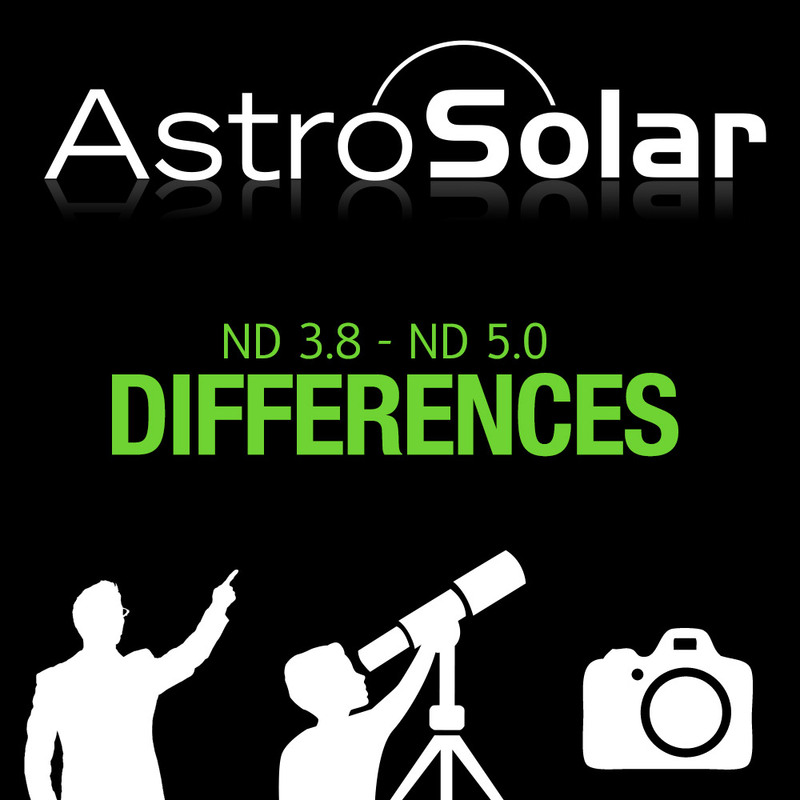 AstroSolar® Photo Film 3.8 is only intended to be used by well-experienced Astro-imagers. AstroSolar® Photo Film 3.8 is not intended to serve for protection during visual solar observation. Also PhotoFilm is not necessary for imaging the sun with camera- or tele-lenses, or in the prime focus of most telescopes. The resulting exposure time would be much too short, respectively the results would cause severely overexposed images. Instead, you can use AstroSolar® Safety Film 5.0 with a modern camera up to a focal ratio of ca. f/15 to f/20 – even at ISO 100. AstroSolar® Photo Film 3.8 solely is used in conjunction with astronomical telescopes – and only in connection with fast digital video cameras. This combination is highly apt to capture finest solar surface detail and granulation at extremely high magnification – but enabling ultrashort exposure increments measured in milliseconds – in order to “freeze” atmospheric turbulence (lucky imaging technique). The results are quite outstanding as can be seen in the image gallery and in the customer reports. Do not use AstroSolar® Photo Film 3.8 until you are convinced to having gained sufficient experience with the hazards of Solar videography while using regular AstroSolar® Safety Film 5.0. PhotoFilm OD 3.8 consists of the same optically treated carrier film with just diffraction limited properties as our AstroSolar® Safety Film with optical density 5.0. The density of the adjacent multiple coatings however has been reduced for Photo Film in a very controlled fashion. OD 3.8 constitutes the border line, to still offer an absolute minimum of eye safety, in case someone would handle with the film and – in spite of extensive care – would accidentally catch up a split second view of the intense solar energy near focus. Still every amount of precaution must be undertaken to avoid just this to happen. Sadly AstroSolar® Photofilm OD 3.8 may not be used for visual solar observation – not even in combination with additional neutral density filters nor other filters of any kind. Reason being: none such filter combo has been tested by any licensed authority for eye safety. Surely such combinations may exist and they may produce magnificent and interesting views with sufficient reduction of solar energy across a safe enough spectral passband. However – as a manufacturer – we would be obliged to warrant for sufficient eye safety and provide safety evidence for an innumerable amount of possible filter combinations each having it´s own certification. For this reason we must leave it with the clear statement that we do not approve of any other use for AstroSolar® PhotoFilm than described above. I want to take images of the sun. Do I need AstroSolar® 5.0 or 3.8 Film? In short, you can use the visual version of the filter (AstroSolar® Safety OD 5.0)without any problems for prime-focus photography with a DSLR. You need the photographic version (AstroSolar® PHOTO OD 3.8) only for higher magnifications, e.g. if you use eyepiece projection to achieve high magnifications and to capture details on the sun with video cameras. If you use a camera which is attached directly to the telescope (in the prime focus), without eyepiece or camera lens, then AstroSolar® Safety Film (OD 5.0) is perfect for you. Then, you also don’t need to worry about looking into the sun through the camera’s viewfinder, and a modern digital camera will achieve exposure times which are so short that they will freeze the seeing. As a general rule, you should always use the display / live view of your camera and never the optical viewfinder, if you are working with the OD 3.8 film – with Safety Film OD 5.0 you can also use the viewfinder. The solar granulation can be captured even with 600mm of focal length, although a good location (clear, transparent sky) and some image manipulation for enhancing the contrast are really helpfull. The aperture is as important as the focal length, because it defines the resolution of the telescope. A good lens telescope with 80-100 mm aperture is enough. But to see these structures clearly, you should use focals lengths of 1500-2000mm and at least an aperture of 125-150mm – then you have a focal ratio of about f/10, which allows for sufficently short exposure times with a DSLR and Safety Film OD 5.0. But don’t forget that these are only aproximate values, which also depend on the resolution of your camera – that is, the pixel size. The focal length which is necessary to project the whole sun onto the sensor depends on the sensor size – as a rule of thumb, the sun appears ca. 1 cm large for each meter of focal length. You can reach higher magnifications with eyepiece projection. For this, you need either slim 1¼”-eyepieces and an adapter for projection, or – better – eyepieces with a thread close to the eye-lens like our Hyperion 68° or Morpheus 76° eyepieces. You can find many possible ways for attaching a camera in the Hyperion PDF. Formulas for calculating the resulting focal lengths (sorry, so far only in German) can be found on the description of our OPFA – Ocular Projection and Focal Adapter. You can reach extreme focal lengths easily with eyepiece projection – thus, the image will get too dark, and you need the photographic film to achieve short exposure times. The seeing will be more prominent, too, so it is better to take many images instead of single shots. For this, you need a video module, so that you can select and process only the best images – this is called “Lucky Imaging”. So, you can usually take the Visual Safety Film (ND5.0) also for photography, als long as you don’t take solar photography to the extreme. Posted in About AstroSolar® Solar Film.